For 11 days Grahamstown will become the cultural mecca of South Africa when the National Arts Festival draws artists, dancers and musicians from around the world to perform on its stages from June 29 to July 9. 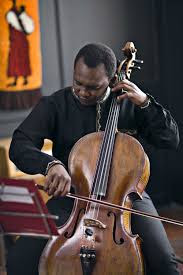 The National Arts Festival has become a homecoming pilgrimage for many South African artists living and working abroad and this year is no different: Cellist Abel Selaocoe, the 2017 Standard Bank Young Artist for Music, returns from the UK to present an excitingly diverse recital at the Festival as well as to perform as a soloist at the Festival Gala Concert on July 8. Soweto-born dancer and choreographer Vincent Mantsoe returns from his home in France to perform KonKoriti. Described by The Guardian’s dance writer Sanjoy Roy as a “magnetic soloist”, Mantsoe is best known for his work around spirituality and African and indigenous heritage. In KonKoriti, he takes on the foolishness of pride and arrogance. UK comedian Stephen K Amos is including Grahamstown in his World Famous tour with two unmissable shows. “I want you to laugh and then I pull the rug from under your feet by making you think about quite important points,” Amos has said of his brilliant brand of observational comedy. The fascinating It’s Only Birds is another sure-fire Festival hit. Comic Louise Reay, fresh from the Adelaide Fringe (Best Emerging Artist 2017) and Edinburgh Fringe (Groundbreaker Award 2016), performs the play in Mandarin. The artist’s challenge to her audience is that they will still understand the play through non-verbal communication, with astonishing results. Excavating history, faith and cultural integration, the one-woman show from the UK, The Crows Plucked Your Sinews is performed by Subaan actress Aisha Mohammed, with the accompaniment of Oud musician Abdulkader Saadoun. The play weaves the narrative of a young Somalian woman living in London in 2011 with the war in Somaliland in 1913. Described by North West End press as “an important piece of theatre that needs to be seen”, the production runs from July 5 to 8. In partnership with Business and Arts South Africa and the World Fringe Alliance, Macho Macho (Best of Amsterdam Fringe 2016) will be presented as part of the Arena programme, a collection of works that have won a Standard Bank Ovation Award, a Cape Town Fringe Fresh Award or a jury award at an international fringe festival. Macho Macho explores ideas of masculinity – from bromance to beer drinking – through intensely physical and vibrant stagecraft. With sell-out runs at London’s Soho Theatre and at the 2016 Edinburgh Fringe Festival, Police Cops is a slightly different spoof on masculinity – and epic cop movies. This highly entertaining and energetic piece has taken home a string of theatre awards, including the Cape Town Fringe’s Best International Show Fringe Fresh Award in 2016. Performance art lovers are in for a treat with a double bill by Swiss choreographer Philippe Saire. Neons and Vacuum form part of a series called Dispositifs, where the visual concept leads the creative process. Neons tells of the intensity of a relationship through contrasts in light, while Vacuum is an interplay of black holes and dazzling lights. International guests on the Think!Fest programme include Galen Bresson (CEO of Creative Industries and National Events Agency in the Seychelles), Natalie Kombe (Shoko Festival Coordinator in Zimbabwe) and Jiggs Thorne (Director of the Bushfire Festival in Swaziland). They will be participating in several events including #ArtOut and a panel discussion on curation. Professor Emmanuel Dandaura vice president of the International Association of Theatre Critics (IATC) will be attending the Festival for the launch of a local chapter of IATC and, along with dancer/choreographer, Hannah Ma from Germany, all of these international guests will participate in an International Arts Symposium open to artists to be held at NELM on July 6. The Standard Bank Jazz Festival will present an array of international artists including Australia’s James Morrisson Quartet, Brazilian bass prodigy Michael Pipoquinha (performing solo and with Swiss pianist Malcolm Braff) and US steel pan master Andy Narell. A hallmark of the Jazz Festival is the SA/international collaborations. Among those on the bill this year are former Standard Bank Young Artist winners Shane Cooper and Bokani Dreyer performing with phenomenal international musicians Christoph Iringer (CH) and Ziv Ravitz (US). In a first for the Festival, Grahamstown audiences can attend screenings of two of the UK’s National Theatre productions; Twelfth Night and Amadeus. According to National Arts Festival Executive Producer Ashraf Johaardien, it has been particularly tough to programme international work in the current economic climate. “The Festival is very fortunate to have a network of strong diplomatic relationships who along with the World Fringe Alliance, have stepped up once again this year to help us bring some of the best of the world to the Festival’s stages and platforms,” Johaardien said. “In addition to bringing this work to the Festival audiences, we are particularly keen for our artists to meet artists from around the world as the Festival has an important legacy of forging opportunities for artists to create incredible work together,” he added. The National Arts Festival is grateful to: the Department of Arts and Culture, Eastern Cape Department of Sport, Recreation, Arts and Culture and the Office of the Premier, and Standard Bank of South Africa. Media partners include MNet and City Press. The National Arts Festival’s programme is online and available for booking on the site www.nationalartsfestival.co.za – or click on the banner advert at the top of this page.